High profile friendly awaits us as Roy Hodgson’s England will face World Cup holders Germany in Berlin on Saturday night. 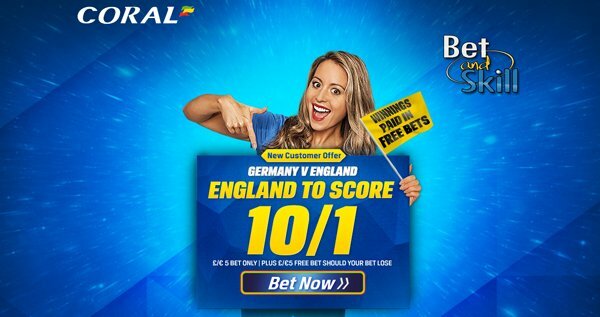 Read this article if you are looking for the best GERMANY v ENGLAND betting preview with expert predictions, betting tips, enhanced odds, probable lineups, streaming links, bookie bonuses and no deposit free bets on the clash! Since winning the World Cup in 2014, Germany have only won eight of their resulting 15 matches. Their form has declined since winning the World Cup 18 months and they have lost 2 of their last three matches, 1-0 Ireland and 2-0 to France with a 2-1 win over minnows Georgia sandwiched between them. Captain Bastian Schweinsteiger has been ruled out for the rest of the season with a knee injury and he is a serious doubt for the Euros in the summer. Karim Bellarabi looks likely to recover in time to feature as well as Arsenal midfielder Mesut Ozil while Mario Gotze will make a return to the starting line-up since his long term injury lay-off. Defenders Jerome Boateng and Benedikt Howedes are both out through injury. England finished top of their group after 10 successive qualifying victories and only the 2-0 defeat to Spain away from home on last November ended their match undefeated streak. Anyway, the Three Lions bounced back with a 2-0 win over France 4 days later and have kept a clean sheet in 5 of their last 6 matches. Jack Butland and Fraser Forster are in competition to deputise in goal after Burnley keeper Tom Heaton was a late call-up to Roy Hodgson’s squad, replacing the injured England number one Joe Hart. Leicester City midfielder Danny Drinkwater is rewarded with a call-up to the national side for his excellent performances in England Premier League and could start. Harry Kane and Daniel Sturridge are battling to start up front, as it appears Jamie Vardy will have to settle for a place on the wing. Tottenham’s midfielders Eric Dier and Dele Alli could start alongside Liverpool’s Adam Lallana in midfield. Die Mannschaft have won three of the last four meetings between the two sides, including the controversial 4-1 win at the 2010 World Cup, but have interestingly failed to win in their last three friendly games. GERMANY (4-2-3-1): Neuer – Ginter, Mustafi, Hummels, Hector – Khedira, Kroos – Muller, Ozil, Reus – Gotze. ENGLAND (4-3-3): Forster – Walker, Cahill, Smalling, Rose – Lallana, Dier, Alli – Welbeck, Kane, Vardy. Double boost! 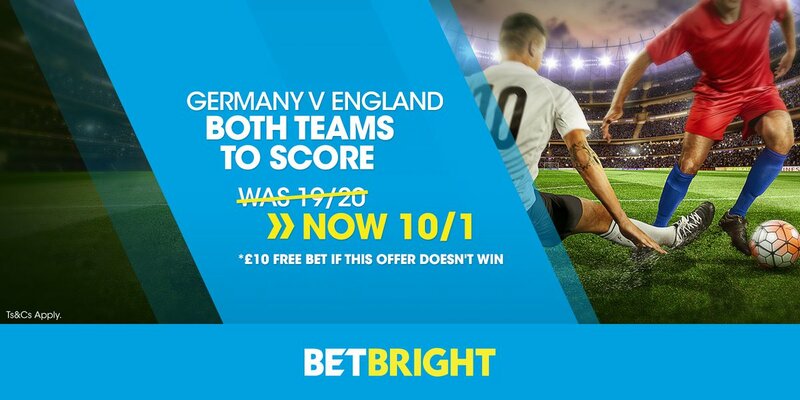 5/1 Germany or 14/1 England to win + £100 bonus! Germany price boost! 4/1 to beat England + £20 in free bets! Best price! 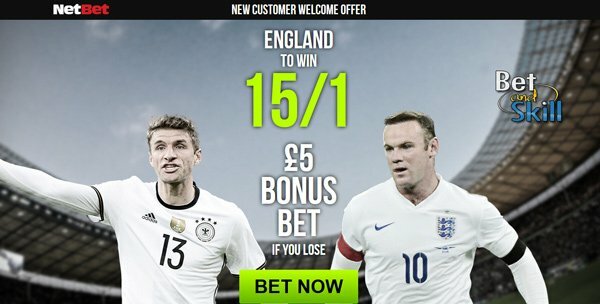 Get 15/1 England to beat Germany + £5 bonus bet! Easy money! 10/1 England to score + £5 free bet! Crazy price! 14/1 England to beat Germany! BTTS boost! Get 10/1 Both teams to score m + £10 free bet! Boosted price! 5/1 Germany to win the match! "Germany v England predictions, betting tips, lineups and free bets (International Friendly - 26.3.2016)"